So here what we are saying is that the surface where the user can grab to drag the panel is the Border. Ok so there is some work to do in order to use this control, so I decided to create a control that handles all this stuff for you. 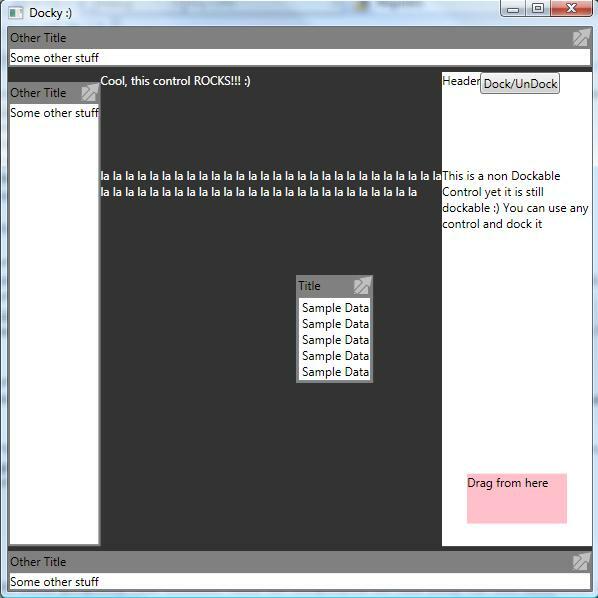 The control is called DockableControl and it inherites from HeaderedContentControl. This control handles all attached properties and commands for the DockableContainer so all you have to do, is to feed the Header and the Content and all the other stuff is catered for. I created a Demo Project for this control so that you do not need to download AvalonControlsLibrary (well in actual fact I didn’t commit the changes to codeplex yet since I am still doing some refactoring 🙂 ). 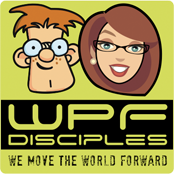 Download the code for this control and see how it works to get a better idea of how one can use this control….. It will be really cool !!!! 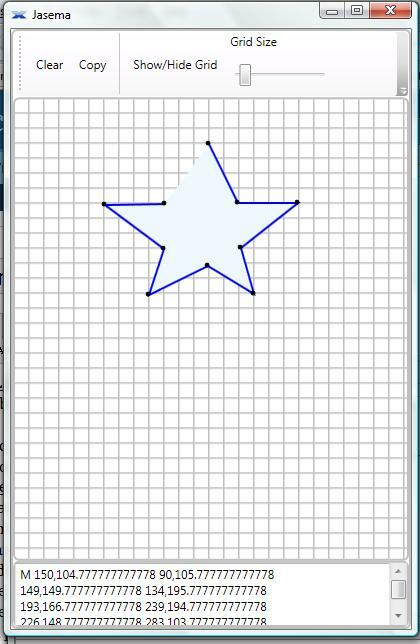 You don’t have to be a WPF Expert to know that this would not work…. Yet it would be quite Handy to have… so I created a small Markup Extenstion that can do this for us…. I am going to post the full source because it is quite small ! Thats’s it basically…. The Markup Extension will now modify the Binding that you specify by setting a converter that is able to attach a string infront of the value of the Binding…. So now we can do this…. Why did I decide to use a converter and set it to the binding, instead of just return the string passed (AttachString ) and the value of the binding concatenated? well very simple because of the binding…. what would happen then when the binding value changed!!! A markup extension will only spit an object for the parser yet if we modify the binding we would achieve what we what i.e that the binding still updates…. I am currently working on a plugin (I cannot give any more information about this yet I will post it on my blog shortly) using WPF. The main application that hosts all plugins uses the System.Addin (.Net 3.5 version). While developing the plugin I got into a brick wall… Basically I was calling the AdornerLayer.GetAdornerLayer, passing the instance of the plugin UI as parameter yet the method was returning a big and ugly null. 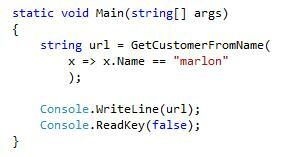 Then in C# i just call the myAdornerLayer.AdornerLayer and do what ever I want with it. This solution does not help if you want an adorner layer for all the main window that is hosting your plugin, the adorner layer will ONLY cover the surface area of the plugin. Yet if you do not need the whole area of the main window but only the surface area of the plugin, this solution should work just fine …. Let us start…. Why is LINQ so exciting for me? That’s a good question … Well 99% of the people that know me would probably answer “It is a new .Net feature so definitely Marlon will be more than excited about it!”. Yet my friends, let me give you the answer myself! The BIG thing about LINQ is that in C# you can stop being so imperative and bossy and start being more declarative (aka goal oriented). So basically you express yourself by creating a query and then let the underlying provider to do all the work…. To understand more what I mean have a look at Linq to SQL. So assuming that you have already seen and tried LINQ, today I will talk about how the underlying systems can read the query that you write and parse it. 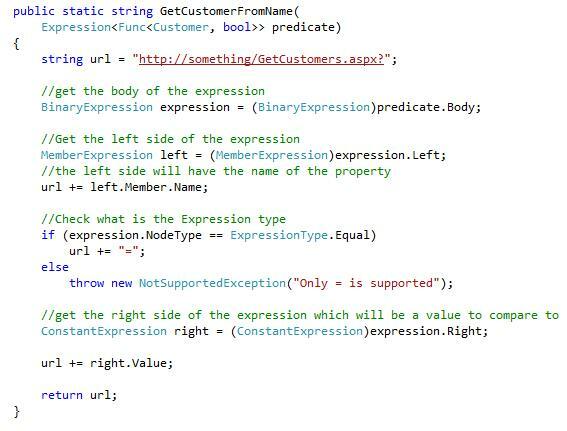 We will not talk about LINQ but instead we will talk about Lambdas and Expression Trees. Ok, so you would be wondering what is the difference between these 2 statements. Well there is quite a lot of difference. When the compiler grabs the first statement, it will treat this line of code like a normal delegete, producing MSIL that can “run” the specified code. Yet for the second statement the compiler will build an Expression Tree so that who ever receives the “test2” can parse the expression tree and do some work. To have a better idea of what I am saying I opened my friend Reflector and disassembled the two statements. Quite a big difference one can notice ! First let’s create the Customer class. Now that we have the class let’s create a dummy method that will eventually be our URL provider. So the method above accepts an Expression of type Func that has a Customer generic type and a bool as return type. The method will later parse the expression to form a URL out of it. Now lets’ call this method to see how the code for the lambda would look like. Great we have everything set up and now we can start having some fun parsing the Expression Tree (FINALLY). The expression that was passed to us contains a Body property. The body is a BinaryExpression that contains a Left property a right property and a NodeType property. 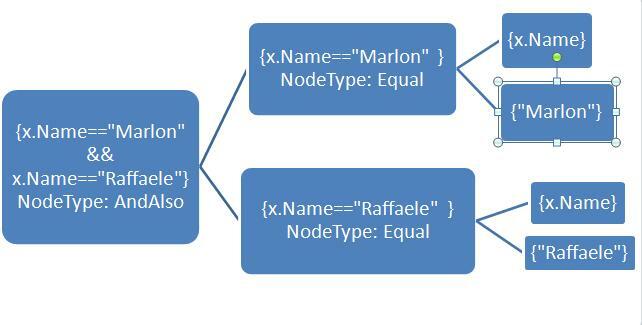 Then we would get a nice Exception because the Left Expression would not be a Member expression anymore but it would be a BinaryExpression that contains the x.Name == “Marlon” and the Right expression would be the x.Name = “Raffaele”. Something like this. This can go on infinitly (or maybe until the developer gets tired writing the lambda 🙂 ) and that is why recursion is needed for parsing an expression tree. I will dive into this on my next post on Expression Trees, right now I will dive into my bed because I cannot make my eyes stay opened any longer…. So guys I hope you liked the article I will be posting Part 2 where we will implement a much more complex expression parser using some recursion and god knows what not. I am pleased to announce that the AvalonControlsLibrary has been uploaded on CodePlex. I am looking forward to see this project evolve more and more in the near future. Looking forward to see more suggestions for this library so that together we can make this library grow ….